Way back before computers and e-readers there were these lovely things called books, and one of the best ways to indicate that a book was your book and not someone else's book was to stamp it with a decorative label commonly known as an ex libris (Latin for "from the books of..."), followed by your name. 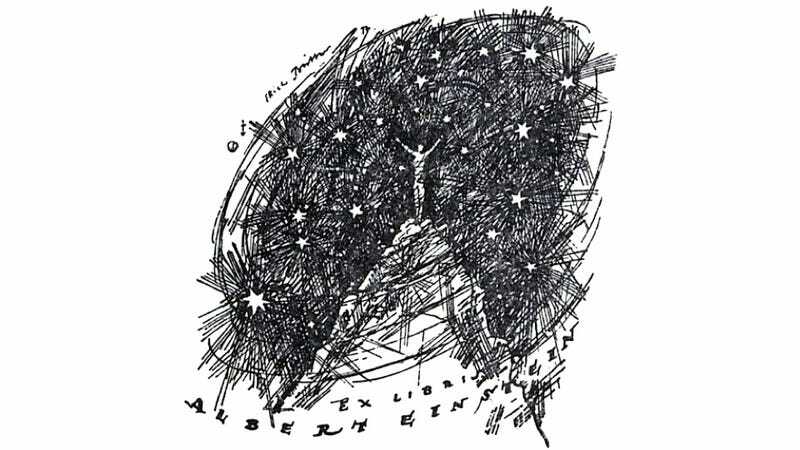 Albert Einstein's ex libris is reportedly based on a doodle he drew up (probably in the margins of a paper describing the photoelectric effect, or something), and according to Ron Miller below, was designed by German painter Erich Büttner circa 1917. It depicts a solitary stargazer, perched atop a mountain with arms spread wide, soaking in the celestial dreamscape that is the Universe. It is, in a word, awesome. Typical Einstein.